Over the past decade, numerous companies have begun to specialize in custom home closet designs. These companies create beautiful, yet functional closets that provide custom storage areas for a more organized lifestyle. Among these companies, some offer closet storage components for do-it-yourself installation. According to the National Association of Home Builders, lack of usable closet space is the biggest complaint homeowners have. A closet crammed with clothing, shoes, and boxes can make it frustrating to get dressed in the morning, or put your clothes away at night. 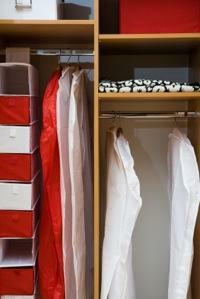 A well designed closet can save time and money, as well as a lot of frustration. If you have a large, walk-in closet for example, you may want to have built-in shelves, drawers, and even an area where you can sit down to put on your shoes. A sizable closet allows you an enormous amount of creativity with the design. Yet even a small closet can be transformed into an appealing, organized space with a little work and planning. The average closet is the reach in closet. These closets generally have an upper shelf and below it a bar for hanging clothing. The closet shelf tends to get stacked with numerous boxes, clothes are crammed in and falling off hangers, and shoes get thrown into a jumble on the floor. For those interested in custom home closet designs, the possibilities are endless. A series of shelves can be installed in the closet with two areas for hanging shorter items of clothing like shirts and skirts. Another standard height hanging bar provides space for pants and dresses. These units are generally designed to fit up to a ten foot long closet and provide up to twenty-four feet of shelf space. All of these and more are available in custom home closet designs when you have a large closet. Planning is the hardest part of designing a closet, but it is also the most important part. Start by grouping items in your closet. Put the dresses in one area, shoes in another pile, and continue doing this with all of the items in your closet. Look at the piles and figure our how much space is needed for each group. Draw a rough diagram depicting your needs. For example; shelf space for purses, drawers for lingerie, an area for hanging dresses, etc. Remember, you can create more usable space with two parallel clothes bars for shorter items like shirts and skirts. Don't forget to add in baskets to hold scarves and other hard-to-store items. Keep your clothing items in categories. Mixing them will cause your closet to become disorganized again. Choose closet components that best fit your needs. Whether you plan on doing the work yourself or hire a company to come in and install the closet for you, the choice of closet organizer pieces and style is yours. When your closet is finished, place things into it according to your chart. Closets to Go has an online tool that allows you to design your closet on the computer. The tool is free but you will have to register to use it. Cozy Closets has a gallery for ideas. Paradise Closets has a large gallery of images. Closet Tailors has images of luxury customs closets. Many home improvement stores carry stock items to create custom closets. You can add cabinets and drawers from the kitchen department as well. Whether you have a brand new custom home or a 1950s ranch style an organized closet is an investment in your home. Not only will it save you time and stress but custom closets can be attractive to potential buyers when it comes time to sell your home. Whether you use a contractor or do it yourself, designing custom storage spaces for your home is a smart investment in your home and your time.